From here on I know I will have some sad days but now I have the skills and support to help me cope. When I lost my son to suicide I felt so alone and confused. The bereaved by suicide group was the only place I felt safe to show the pain I was in. It is difficult to describe the amazing journey and growth I've experienced in the group - the meetings were a safe oasis where I found peace in my pain. Dr. Diana Sands is the Director of the Bereaved by Suicide Centre for Intense Grief, Lower North Shore, Sydney. For over two decades Dr. Sands has provided counselling for loss and grief following sudden, violent and traumatic death and in particular individual, couple and family counselling for those who have lost a loved one through suicide. This kind of grief is so intense it can shatter a person’s world. I create a safe haven to support the process of putting together the pieces and telling their story, with the loved one as a valued resource and comfort to assist in coping with grief. Dr. Sands an experienced family and narrative therapist draws on a range of counselling modalities and expressive artwork in supporting those bereaved. The counselling practice and unique mutual-help therapeutic, psycho-educational group programs for those bereaved by suicide are based on her research in suicide grief and the 'Tripartite Walking in the Shoes Model of Suicide Bereavement'. The group programs provide a space for a community of grievers to meet, gain support, resilience, and understanding with others who are also bereaved as they rebuild their life. Dr. Sands is the Professional Advisor to Wings of Hope Inc., the voice of people bereaved by suicide, and is active in working on committees and conferences that educate and increase awareness about loss and grief issues. 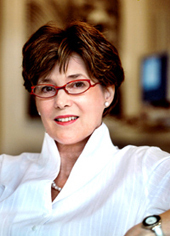 Diana also lectures on suicide prevention, postvention and intervention at the Jansen Newman Institute of Counselling and Applied Psychotherapy and provides understanding loss and grief seminars, community talks and training workshops for professionals in Australia and Internationally. 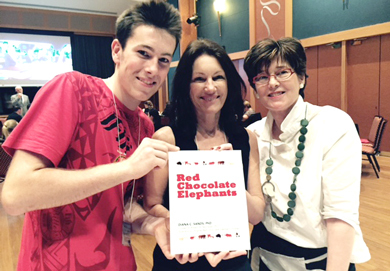 Diana is the author of a number of publications, including book chapters, academic journal articles and recently a book and DVD titled the 'Red Chocolate Elephants: For Children Bereaved by Suicide'. This workbook and DVD resource offers practical ways to sensitively engage with children about the difficult questions of a death through suicide. To place an order or find out more information, click here. The Open to Hope Foundation provides an online forum with information and support so that people who experience loss can learn to cope with their pain, heal their grief, and invest in their future. 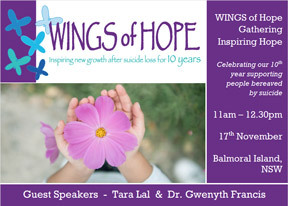 Wings of Hope Annual Gathering is taking places on 17th November 2018 from 11am - 12:30pm. A chapter written by Dr Robert Neimeyer and Dr Diana Sands ‘Suicide Loss and the Quest for Meaning’ in Postvention in Action: The international handbook of suicide bereavement support. 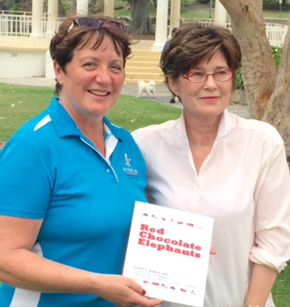 Diana with Elaine Jensen, Treasurer, Life Worth Living, who have received generous funding for Red Chocolate Elephants books and DVD's to be placed in Schools and Community Organisations throughout the Narrabi District. 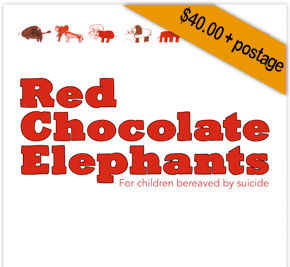 Cathy VanExtel of ABC Radio National produced today's story on The Red Chocolate Elephants DVD/books being delivered to schools and those in need in the Riverina region. Listen to Wendy McWilliam, Acting President Wings of Hope and Lexi King, Volunteer, Friends of Pastoral Care, Leeton District Hospital speaking along with excerpts from Red Chocolate Elephants resource. 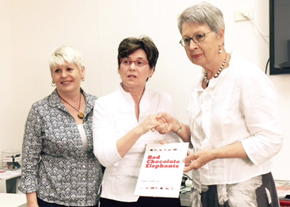 Diana with Lismore Mayor, Jenny Dowell and Rose Hogan, NSW North Coast Coordinator StandBy at the recent Red Chocolate Elephant Workshop held in Lismore. 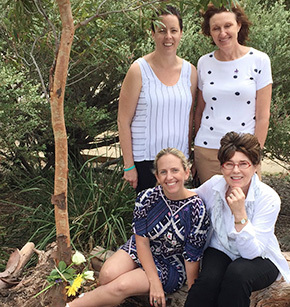 "Weaving a community response to those bereaved by suicide"
Dr. Diana Sands is presenting a Pre-Conference Workshop at the Suicide & Self Harm Prevention Conference, Cairns June 2015.